Born in France in 1988, Chloé was a Quarter-Finalist in the International Conducting Competition in Besançon, and was one of the 20 finalists selected for the Donatella Flick LSO Conducting Competition 2018. 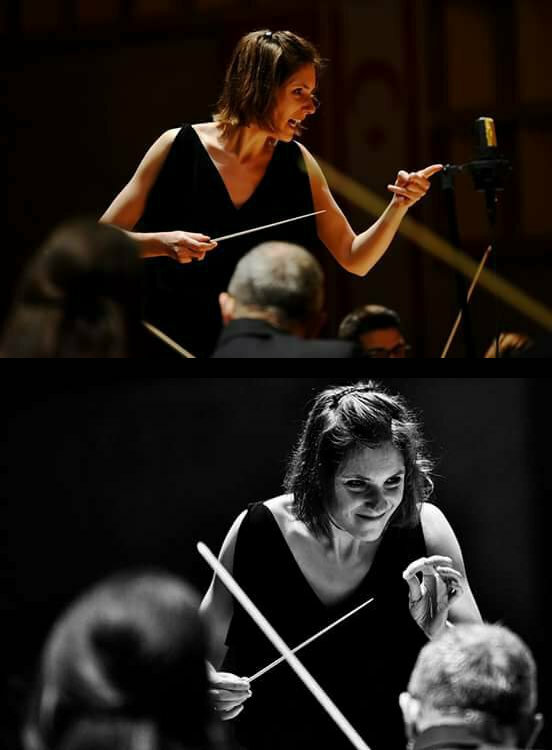 She works regularly as assistant conductor to François-Xavier Roth in France and has assisted several major conductors including Jurowski, Petrenko and Sir Mark Elder. Highlights of the coming seasons include debuts with the Orchestre National de Lille, Aurora Orchestra, Opéra de Lorraine and Royal Philharmonic Orchestra. Chloé is also founder and chief conductor of the Arch Sinfonia. Chloé has taken part in masterclasses with Mena, Alsop, Petrenko, Elder, Paavo Järvi, Grazynite-Tyla, Schläfi and Panula. She has served as Assistant Conductor to Sir Mark Elder with the Hallé, Jurowski at the London Philharmonic Orchestra, Storgårds and Gernon with the BBC Philharmonic, Petrenko and Tortelier with the Royal Liverpool Philharmonic Orchestra. She works with François-Xavier Roth and has assisted him on projects with the Les Siècles in partnership with Cité de la Musique de Soisson and on two projects with the French Youth Orchestra (in Aisne). After reaching the final rounds of the London Symphony Orchestra competition and the Quarter-Finals of the Besançon conducting competition, Chloé was invited to conduct and co-produce a recording with Karine Deshayes and the Orchestre Victor Hugo Besançon Franche Comté. In 2018 she was a featured artist in France TV1’s Grands Reportages in an episode titled Mon Métier de Rêve (My Dream Job) and in France 3 'Fauteuil d'orchestre' conducting Orchestre de Chambre de Paris. Chloé has conducted Aurora Orchestra, Orchestre National de Lille, Besançon Symphony Orchestra, the European Union Youth Orchestra in Italy, the Southbank Sinfonia in London, the Manchester Camerata, and she is working regularly with the North Cyprus Symphony Orchestra, most recently with pianist Ruya Taner, cellist Knut Weber and Soyoung Yoon as soloists. Keen on working with young musicians, Chloé is a regular guest conductor at the National Children's Orchestra of Great Britain, the Hallé Youth Orchestra and in 2017 she was guest Artistic Director and Guest Principal Conductor of Greater Manchester Youth Strings Orchestra. From 2019, she will be Music Director of the Hertforshire School Symphony Orchestra succeeding to conductors Ben Gernon and Ben Glassberg and where she will be conducting their German tour. Also keen to expand into opera, Chloé was assistant conductor at Holland Park Opera on a production of Mascagni Isabeau. Coming up, Chloé will make her debut with Orchestre National de Lyon, Southbank Sinfonia at London’s South Bank Centre, Bolzano festival with Haydn Orchestra and Virgilio Sieni dance company, Royal Philharmonic Orchestra, Ankara Symphony Orchestra, Orchestre National des Pays de la Loire, Orchestre de l'Opéra de Lorraine, Tenerife Orchestra. In 2012, Chloé founded the Arch Sinfonia, a vibrant chamber orchestra based in London renowned for its boundless energy and committed performances. Arch Sinfonia performs a wide range of repertoire, and strives to build bridges between artists and audience; guest artists have included Hannah Roberts, Katy Woolley, Zsolt Tihamer-Visontay, James Fountain, Amy Harman amongst others. Chloé studied the viola at the Royal Academy of Music and as a violist has performed with the European Union Youth Orchestra, the Pacific Music Festival, Bournemouth Symphony Orchestra, Aurora Orchestra and at the Royal Opera House and several times at London’s Wigmore Hall. Between 2015-2017 she studied conducting at the Royal Northern College of Music with Clark Rundell and Mark Heron where she was awarded the Kennedy scholarship and was also supported by the Derek Hill Foundation. © Chloe van Soeterstede. Website by Damian Moore. Template based on HTML5 UP.